The South African housing programme has delivered approximately 2.68 million subsidized low income housing between 1994 and 2016. The delivery process has occurred within complex policy, institutional and socio-economic environment. The key constructs of the housing programme have largely been influenced by international discourse on neoliberalisation of housing policy embedded on the reconfiguration of State role in housing delivery process. As a result, the State’s housing programme is dominated by neoliberal ideals of housing as an asset premised on assumptions that the beneficiaries would invest in their houses with an objective to, at an appropriate stage, sell in order to finance the purchase of a new property in the next rug of the housing ladder. 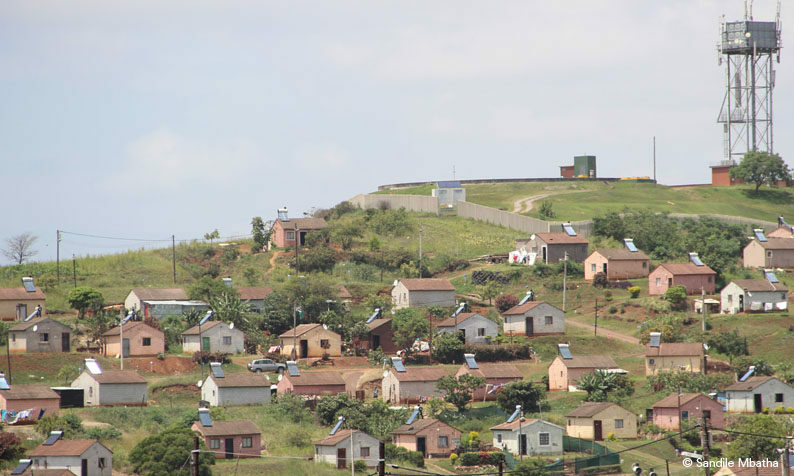 Since early 2000 there has been a growing speculation that these government subsided houses are being sold informally by beneficiaries who then return to informal settlements. The State’s response to this speculation was an introduction of a pre-emptive clause meant to prohibit informal transactions before the expiry of the 8 year period. However, this prohibitive measure is contradictory to the State’s neoliberal housing policy ideals. The study is based on the contention that informal transaction processes and practices are inadequately understood in the housing discourse and literature. There is no sufficient information on the extent and nature of this phenomenon. Using the case study of two low income settlements of eThekwini Municipality in South Africa, the research sets the objectives a) to determine the effect of policy and legislation on informal housing transactions; b) to explore the extent and nature of informal transactions; c) to assess beneficiary awareness about legal provisions on RDP transactions; d) to identify broader implications of informal transactions for socio-economic, political and cultural issues in the context of the post-apartheid urban governance; and e) to explore whether informal transactions are linked to factors beyond market conceptualization. A series of interviews, household surveys, focused group discussions and observations were used to collect empirical data. A grounded theory methodology was used to guide the research process. To place the study within the existing body of literature the research engages with conceptual and theoretical underpinnings that shape and inform housing provision and the housing discourse. 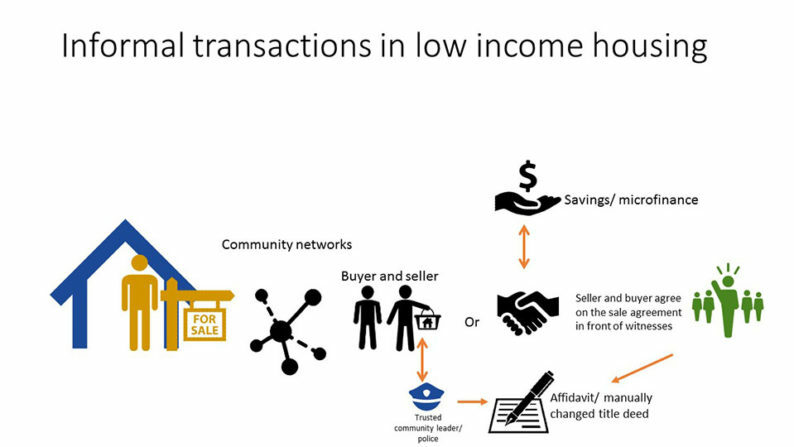 Research findings make influencing factors for the emergence of informal transactions more explicit. It highlights the State’s contradictory perceptions and role in transaction processes and practices. It also identifies policy inadequacies and contradictory policy narratives as a key contributors in the emergence of informal transactions. There is also evidence that indicate that beneficiaries have limited information on formal transaction processes which therefore limits their ability to meaningfully participate in the formal property market. Furthermore, informal transactions occur within the context of multi stakeholder constellations where each stakeholder has its own interest in shaping the outcome of the process. A stakeholder map is drawn to highlight how interactions between these stakeholders facilitate and prohibit informal transactions. The findings also indicate that informal transactions are not as prevalent as initially assumed but are rather sporadic and predominantly informed by individual circumstances. During the transactions process beneficiaries appear to engage in practices that reveal entanglement between State-sanction Western forms of property rights and customary practices. This entanglement further demonstrates the beneficiaries’ disruption of prevailing understanding of property relations. Credits: Images all © Sandile Mbatha / The final thesis report can be found here.